As with any holiday, I find an excuse to bake an Italian bread. 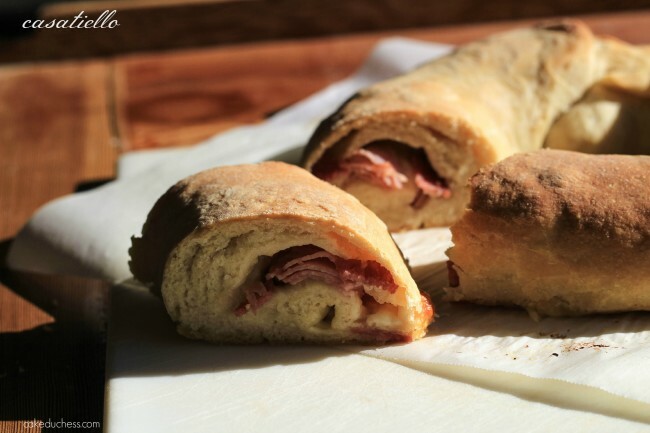 My other goal during the holidays is to find the time to take a few photos of what I created and capture the bread moment to share here with all of you, like this wonderful bread called casatiello. Growing up in an Italian family, I learned the lessons of “waste not, want not”. I live it now as an adult getting to spend time with my in-laws in Italy and when they come to visit us here. My mother-in-law is the queen of finishing every last ingredient before going to buy something new. As my Sicilian father did, Teresa embraces wholeheartedly “la cucina povera” (translated literally: poor kitchen or the kitchen of the poor), but I like to think of it as the creative genius of a home cook that uses simple ingredients that result in incredible dishes and flavors. I always have on hand some ham, different cheeses and salami. I have made different breads with these ingredients, not just for the holidays. But since it was Easter, and a new #TwelveLoaves challenge, I decided to bake a casatiello: a Neapolitan Easter bread. This month #TwelveLoaves bakers are baking with CHEESE…and who doesn’t love cheese?!? It seems there are different versions of this bread in the area of Italy of Naples (Campania)that are made for Easter. During Easter, it has eggs nestled on top and they have crosses made from dough criss-crossing on top of them (kind of like this bread here). I think that this bread actually should be a called a ciambella rustica salata (or a tortano napoletano). I have also seen it called a baba’ salato. I found the Bread Baker’s Apprentice Challenge from 2009 and they made this bread. The recipe in the book (I can’t believe I don’t own that book yet!) is a brioche dough and is different than the one I learned to make. I do know that in the Campania region they are made with eggs stuffed inside with the filling, or placed on top (as I mentioned above). I chose to stick with calling this a casatiello, because Teresa told me a friend from Naples taught her how to make it. When to eat this bread on Easter? It is perfect served as an antipasto for Easter dinner. Any leftovers? It tastes so good even the next day!! If you are in Italy, and are lucky enough to have Pasquetta (the Monday after Easter-Easter Monday), this is what you could pack on your picnic in the mountains. 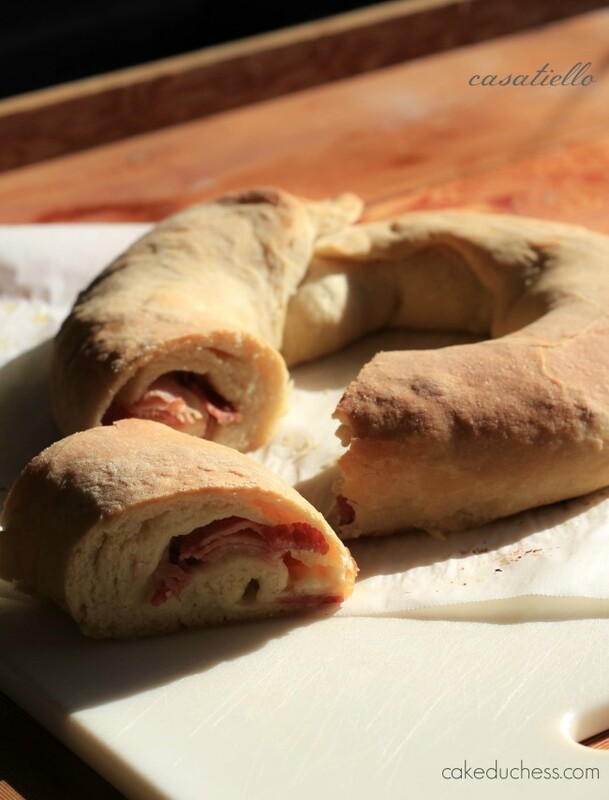 I made a simple pizza dough and stuffed it with ham, salami, provolone cheese and leftover gruyere. 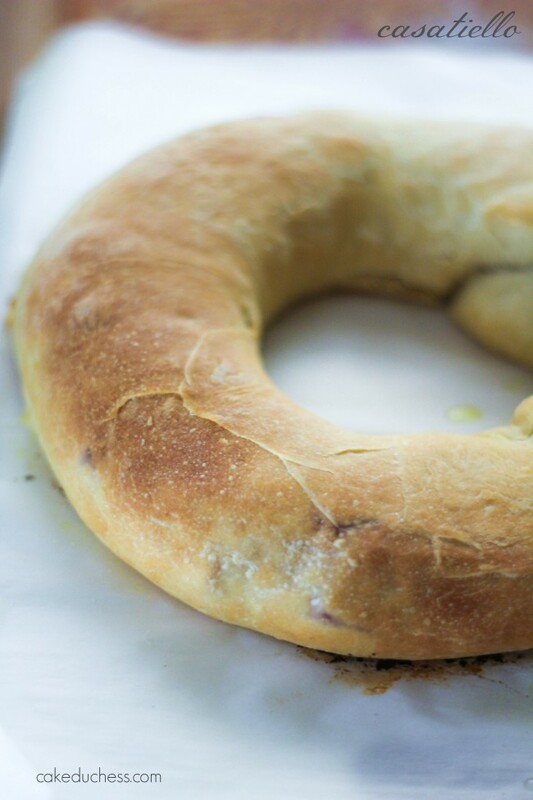 Can I tell you how wonderful this easy dough filled with simple ingredients is? Simply fantastico! It was a hit at Easter and it is a hit whenever I bake it (I don’t make it just for Easter). Our host this month is Robin from A Shaggy Dough Story, and our theme is CHEESE. In a small bowl, add the water and sprinkle the yeast on top of the water. Sprinkle on the sugar and 1 tablespoon of the oil and whisk together. Set aside until the yeast bubbles (about 10 minutes). Brush another large bowl with 2 teaspoons olive oil. In the bowl with yeast, whisk the rest of the olive oil, and salt. Make a well in the middle of the flours and pour in the yeast mixture. Stir with a wooden spoon until a sticky dough forms. Form the dough into a ball and place into the oiled bowl (when I put the dough in the bowl I swish the dough around the bottom of the bowl and then flip it over so all of the dough is covered in a light film of oil). When dough is ready, roll it out to a rectangle about 16×20 inches (about 1/10 inch thick)and cut the ends to make it even. Sprinkle the filling ingredients on top of the dough leaving a 1 inch border. Roll the dough like a jelly roll. Cut the ends so it is even and pinch the dough around the seams to seal it. Bring the two ends together to make a ring and seal them closed. Place the ring on a parchment lined baking sheet. Let the dough rest covered with a towel for about 30 minutes. While the dough is resting, heat the oven to 375F. 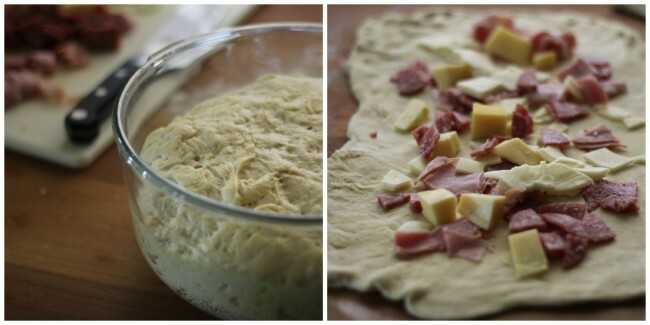 When ready to bake, brush the dough with the remaining olive oil.